I’ve just finished to read The Bourne Identity book, I have to say even the Movie is very different from the book, is one of the few movies I really like even there is only loosely based on a book. I really appreciate the movie since it have more action than book, the book has a great suspense story and there are a lot of characters each one hold a part of the identity of Bourne. I’m waiting the third movie of Jason Bourne and I hope the recent books that Robert Ludlum have written (or is writting) are as good as this one. 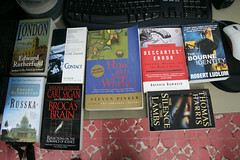 I will need soon buy more books of the Bourne Series as I want to know more about this =). An article worth of read is one found under Communications of ACM in their edition of July: Computer Science is a Natural Science (read online). It provide several thoughts for considering Computer Science a Natural Science, the main concept is the Computer Science works with data creating a flow of transformation to achieve results. The old definition of computer science—the study of phenomena surrounding computers—is now obsolete. 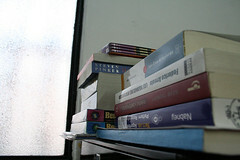 Computing is the study of natural and artificial information processes. I always thought the Computer Science should provide tools and we should focus on it, many of my colleagues think they do alter business working through developing systems; what they don’t know is they are only changing the flow of information not the business per se and we should work to make betters tools instead thinking those tools will replace lack of direction in business. 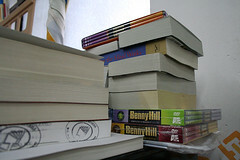 Yesterday and today I got the my gifts I bought at Amazon.com, there are eight books and five sets of DVD featuring Benny Hill. 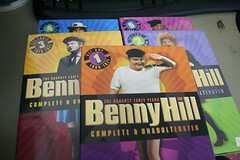 I just need Benny Hill Set Six to make complete my collection, even I only have opened the first DVD set I’m very happy to bought it. I’m testing Windows Vista Ultimate, as I’m working hard with coLinux I need this to work on Vista. The stable version (0.6) will make crash your Windows Vista. Checking on internet I found posts about how to install coLinux on Vista, fortunately the latest snapshots of 0.8 have incorporated all the fixes to install coLinux on Vista without crashing or making more steps. Since the snapshot dir name will change according date.